Fellow employees, friends and family will gather at 1240 West 6th Street to dedicate the center with a special plaque in Ms. White’s honor. The Dispatch Center is adjacent to Integrated Communications Center (ICC) next to the Board Room. 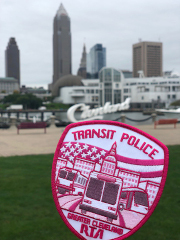 Transit Police and RTA staff are also raising awareness for breast cancer by selling a specially designed “Pink Patch” during off duty hours. Proceeds from the sale of the patch will benefit The Gathering Place, which provides support to individuals and families coping with the impact of cancer. More information about the Pink Patch Project is here.